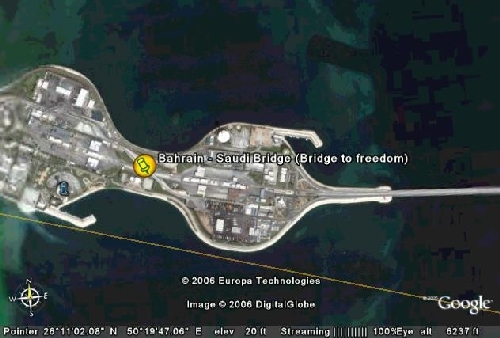 This is the bridge that links Bahrain to Saudi Arabia. It is affectionately named “Johny Walker bridge” due to the heavy influx of Saudis who drive over the bridge to Bahrain on weekends to let loose and consume alcohol which they are unable to do in Saudi. This section is the center section on a man made island where the 2 countries customs are located. 이유인 즉, 주말이면 음주가 금지되어 있는 사우디에서 술을 구하러 이 다리를 타고 바레인으로 많은 사람들이 이동한다고 한다. Google Earth를 통해 본 사진은 아래와 같다. This entry was posted in 세계의 교량 and tagged humor. Bookmark the permalink. Post a comment or leave a trackback: Trackback URL.